"I have some video files in AVI format, but I cannot play these videos on my iPhone. What to do?" In fact, iOS based devices do not support the AVI format. So the way you can do is to convert AVI to MOV format, which is natively supported by iOS devices. AVI is a format container that holds video and audio files created with codecs like Xvid and DivX. AVI files can be supported by limited platforms and applications. So only particularly designed programs can be used to convert AVI file to MOV. Movavi can be a choice when it comes to change AVI file to MOV. However, the output quality of the converted file can be challenge. In this article, we will introduce you to the best way to convert AVI to MOV. iSkysoft Video Converter Ultimate is the highly recommended Movavi Alternative for AVI to MOV conversion. 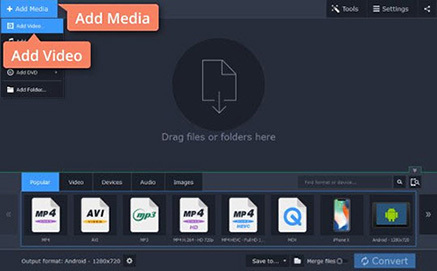 This video converter comes with the same features as Movavi, but more powerful. It helps you to convert media files to any video and audio format, so you do not worry about the format compatibility issue. It is a fast video convert specially designed to convert large files and multiple files in high speed. To enhance your video conversion experience, you are able to edit and customize your video before converting. This feature is useful especially when you want to convert the video and share it to your circle. Furthermore, iSkysoft Video Converter Ultimate lets you to download and convert the online videos directly to specified formats or to your mobile devices. 90X faster video conversion speed when comparing with other converters in the market. You can import any video, audio and DVD files to convert them to other formats. It also lets you to input videos and audio from your mobile devices and camcorders. More than 150 output formats supported, including MOV, MP4, AVI, FLV, MP3, M4A, MKV, etc. The built-in video editor helps you to cut, trim, rotate, crop and watermark the videos. iSkysoft Video Converter Ultimate comes with easy-to-use interface, and even novice users can handle it without any problems. Below we will show you detailed guide on how to change AVI to MOV on Mac. First launch the Movavi Alternative. In the main interface, you will get functions including Convert, Download, Burn, and Transfer. To convert AVI to MOV, you can click on the “Convert” tab. Now you are able to drag your AVI file and drop it to the main interface of the program. The file will be loaded and listed in the program. Batch convert AVI videos to MOV is supported. You can drag multiple AVI files, or click on the “Add Files” button to import more than one AVI videos to the program. iSkysoft Video Converter Ultimate allows you to convert videos to other video and audio format, even to device directly. To change AVI file to MOV, you can click on the format icon and go to the “Video” tab. There select the MOV as the output format. And you have options to customize the output MOV format. You can define the MOV format in 4K HD video. And you are able to set the parameters of encoder, frame rate, bit rate, audio encoder, and more. After you confirm all the settings, just click on the “Convert” button to activate the AVI to MOV conversion process. To enjoy the output MOV video on your iPhone devices, you can go to the “Transfer” tab, connect your iPhone with the computer and do the transferring. Movavi is designed to convert AVI format to other formats as its name indicated. Benefit from its advanced technology, users can use it to convert videos, audio and photos in high speed. Besides, converting AVI, Movavi allows you to convert between media formats in MKV, MP4, MOV, AAC, MP3, GIF, and more. It is integrated built-in parameter settings to make sure you have better output files. In addition to convert video and audio format, you are able to convert the image formats if needed. To enhance your videos, you can use the built-in video editor to do basic video editing before you convert the video. After you download the Movavi video converter program on your computer, double click on the downloaded program file to activate the installation wizard. And then follow the instruction to finish the installation steps. Launch the Movavi video converter. Go to the main interface, and you can directly drag and drop the AVI videos to the program. Alternatively, click on the “Add Media” button and select the “Add Video” option to select your AVI files and import them to the video converter. Now click on the “Video” tab at the bottom of the video list. Choose the MOV format as the target output. Click on the MOV format icon, you are able to choose your desired resolution for the output file. You can define a name and destination for the MOV file. And then click on the “Convert” button to start the conversion. When it comes to video conversion, the conversion speed and output quality should be highly consideration. Though Movavi supports to convert AVI to MOV format, it still has limitations in the video quality and conversion speed. 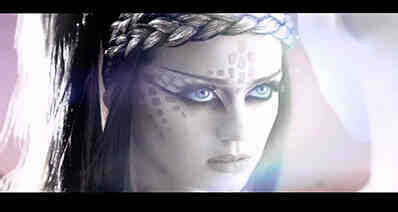 And you are not able to convert online videos or do advanced video editing. 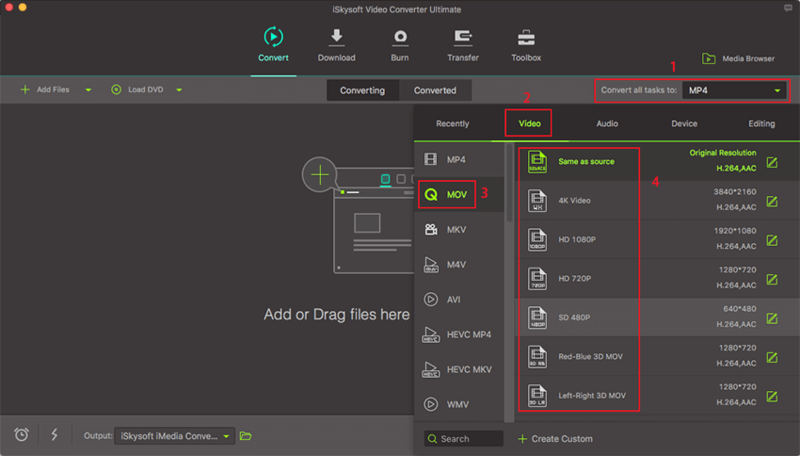 So we strongly recommend you to use iSkysoft Video Converter Ultimate as Movavi alternative to convert AVI file to MOV.